Apart from the Breakaway Impact sinkers there are two major gizmo's on the market for clipping down baits for distance casting. The other is the Gemini ABC clip which also relies on water pressure to release the clip. The pix are self explanitory. Anyone else think of a release clip? Remember that the hook must either be pushed off the clip or enough slack must be created in the snood (about 30mm) so that the hook drops off. There are ways of creating slack from the top end of the snood, where its attached to the rig body but that really is rocket science! In most of these scenarios, when the rig is a paternoster, the length of the snood is critical. I make mine 33cm (plus or minus 2mm - no more). 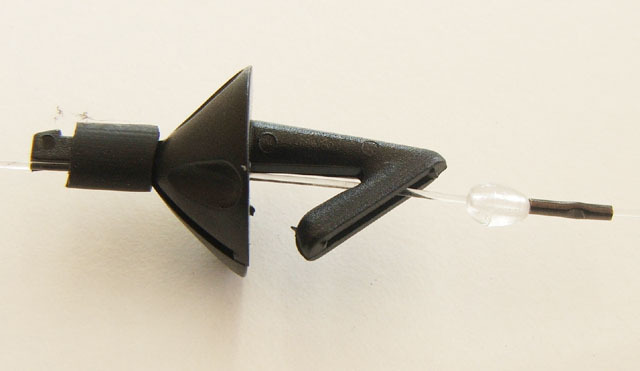 Clip downs are also used for tailor rigs and although a pilly isn't the best aerodynamic shape reasonable distances can be achieved by clipping them down in the sinker slipstream. Last edited by John Softly on Thu Oct 20, 2005 12:54 am, edited 6 times in total. Removing the tail off the pillie makes them throw further. For salmon onthe NSW soth coast we used to reverse the pillie on the gang as they swallow them head first. As a side benefit they also cast further. Doing this with tailor gets more bite-offs unless wire is used too although I have had a few times using garfish when the tailor were headhunting (always big ones ). Now for some rocket science! Clips such as these are minefields for rig makers. One assumes that a normal one hook paternoster is constructed, the baited hook placed in the clip and ‘She’ll be right’. She won’t be right because there will be no slack created in the snood and the hook may or may not come off the clip. Air pressure will keep the baited hook in the clip whilst it is in the air but it will fall off on impact – every time. On retrieve the sliding stop has to be returned to it’s original position prior to the next cast. is possible to fashion the Aeroclip by hand. 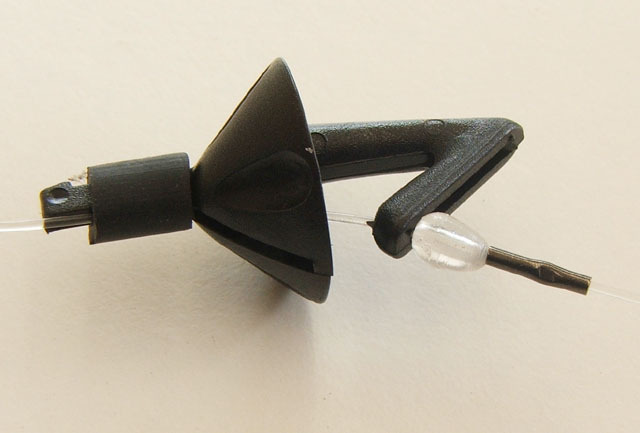 This clip positions the baited hook closer to the sinker than any other. Which stores stock the clips pictured? PS: you can use an fish hook with some of the point section cut away. Breakaway also produce the IMP which is a smaller than the Impact shield. I have a photo but cannot get it to show here. I can emeil to some one who may be able to gey iy shown here. anglerman wrote: Breakaway also produce the IMP which is a smaller than the Impact shield. Yes, they look good - but I can't find a store in Sydney which stocks any of these clips. A few of us in south west WA have been using the imp clips for some timenow and they work every time.Also very few releases mid flight but i have had a number break.The plastic clip part will give way after repeated use with fairly big sinkers eg 170 gram. A question re the imps as I have heard a similar thing from New Zealand. What size bait are you using with the imp, if it is two large it may be moving down over the imp release part and therefore on impact with the water stopping the imp from opening properly, hence the break. Tha bait will move in the action of casting. I have worked on using imps for smaller baits and impact shields for the larger baits. I dont think the imp was designed for large baits. Use mainly mullet strips on a 3 hook snood of 2 5/o and a 6/0 circle on top for sharks and mulloway.Bait is about 8 inches by about 1.5 inches.Use a lot of mulies during daytime fishing for salmon and tailor on a 3 or 4 hook gang of tarpons.When the imp clips break they break at the hole in the plastic as nothing comes back except the stainless bit.At $1.50 each over here they are a bit dear but still the best bet for clip down rigs and overhead reels i think.Some of the UK ebay sites have them for about .50 cents so might order some from there.